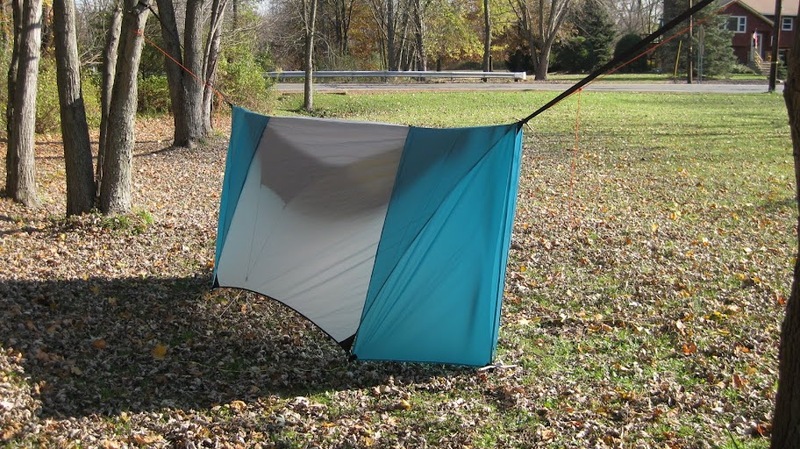 I really like my OES Deluxe Spinn tarp. It is really light and works extremely well to keep me dry. The only issue was that I wished I could seal it up better against the blowing rain we get here in NJ. I also wanted to seal it up a little better in the winter to help trap the warm air from escaping. 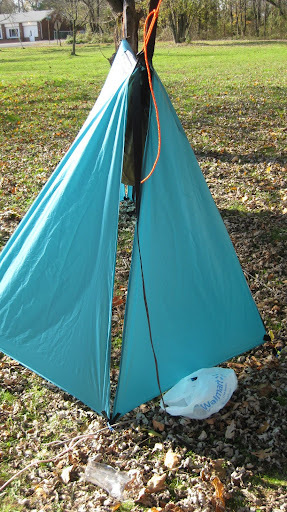 I have played around with different ways to do this, but the Spinnaker fabric the tarp is made from is very light and I am too scared to sew actual doors on it and damage the integrity of the tarp. So when a member on the hammock forums website showed his idea for an attachable vestibule, I jumped on the idea and created one immeaditely. He has since updated the design and now a cottage manufacturer is building them and can be purchased here, it is called the Grizz Beak. My beaks are somewhat similar to the design that is being sold now, but definitely don't have the same tolerances and quality sewing. I also did not cut them to the same dimensions that Grizz had suggested. This was one of my first official sewing projects that I did all by myself. I can honestly say the beaks/vestibules work well but my sewing is pretty ugly. So I won't have any close ups on the seams. In hindsight I think this is the easiest project someone can undertake. The hardest part is cutting the nylon to the correct dimensions, after that is just requires a simple hem around all four sides and some grossgain tabs to hook the beak to the tarp. I built two beaks and used about 7 yards of 1.1 oz DWR from Wal-mart and reused some grossgain I recycled off an old pack. This ended up running me about $10 in materials to build two off them. This is a lot cheaper than what they are going for now, however, when you factor in the time it may be worth it to buy them. With that said here are my pictures of the first setup. 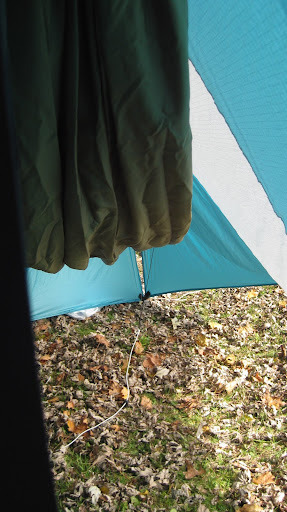 I have used them on one trip so far and was really happy with how they worked and blocked the wind. They take about 10 seconds to clip onto the tarp and only require one extra stake. I have some future modifications planned, but am still working on the design. My goal with the future changes is to reduce the amount of overlap of the beak and tarp so as to save weight. Nice doors, Black Goat! I want to see the next version. I had Grizz send me his calculations for the cut angles for his beaks but it seems simpler to do it like you did. Is there much adjustability for having your tarp pitched a little wider? Does that just make your door coverage shorter along the ridgeline direction? Black Goat Gear. Awesome Inc. theme. Theme images by AndrzejStajer. Powered by Blogger.